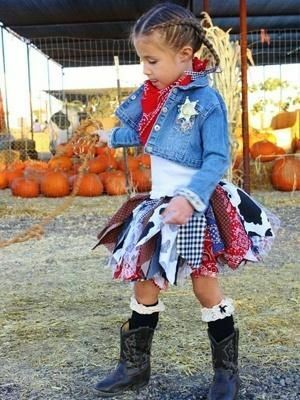 If you plan on dressing your daughter up in a toddler cowgirl costume this Halloween, then you may be wondering how to accessorize the costume – or maybe want some complete cowgirl costume ideas. We found a bunch of really cute and affordable cowgirl costumes here – you should definitely check that page out. 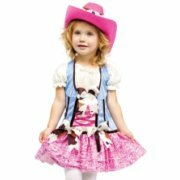 Or, just scroll on down and see all the cute cowgirl costumes for toddler girls that we’ve found. Your basic cowgirl costume will include a long sleeved shirt, a skirt or pants, and a vest that goes on over it. Some costumes also come with knee-high boots. The costume itself should be loose (but not too loose) and be light enough that your child can move around and breathe in it. After all, there’s a lot of partying and trick-or-treating to do on Halloween! It’s not a real cowgirl costume without a play Stetson. Now, this is where things can get a little tricky. Your gut will tell you to get the cheapest hat that you can find, but these are often very light and cheaply made. As in, your daughter will probably tear right through it. Instead, opt for the slightly better hat that is a little heavier and sturdier. Ideally you should get a hat that can be loosely tied beneath the chin, encouraging the hat to stay on while your daughter runs around. Don’t get anything too heavy, which can be bad for the neck, or something that ties too tightly, which can choke your cowgirl. If your girl is one who wants something to do with her hands, then consider getting her a play lasso. We stress that it should be “play” as opposed to real rope, since real rope can easily chafe the skin and be too heavy to pack around when out and about. The “lasso” you get needs to be smooth to the touch and thick enough that your child won’t be tempted to wrap it around its throat – or anyone else’s. Get one with a loop too small to stick a head through. 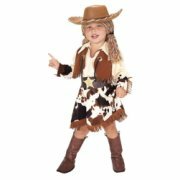 With a little imagination and due diligence, your daughter can be dressed in the best toddler cowgirl costume on the block, while also being safe this Halloween. Teach her to do a cool trick with her lasso and watch the candy stack up!